THIS IS RUBY / HORSETHIEF. Ruby/Horsethief (generally referred to as "Ruby") is the perfect place for groups looking to experience a comfortable introduction to desert multi-day river expeditions. In Ruby Canyon, the Colorado River carves a course away from the highway - entering a true wilderness area with beautiful sandstone walls and rock spires that house desert animals and birds including bighorn sheep, great blue herons, and playful river otters. 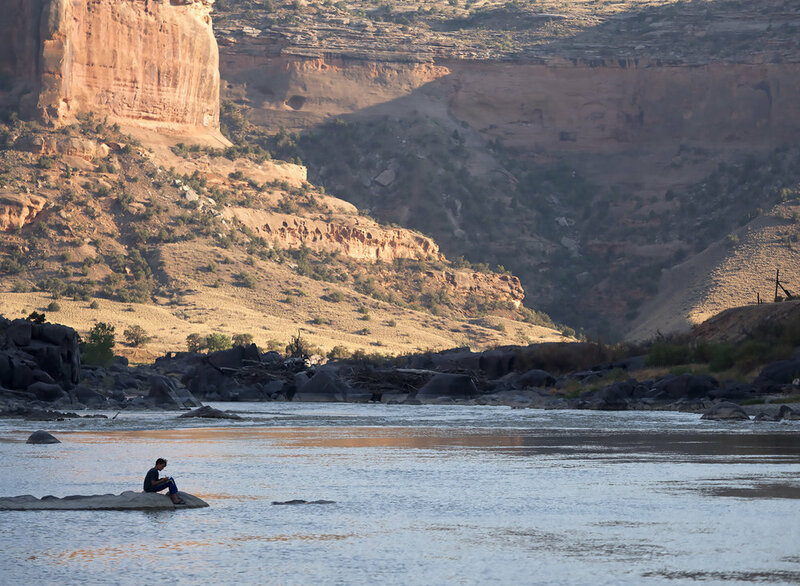 The water is warm as it flows through Ruby Canyon in late summer, and the gentle flows encourage Ruby explorers to spend as much time in the water as they do on it. On shore, there are several hikes leading to ancient petroglyphs and interesting side canyons that provide incredible hands-on opportunities to study the desert ecosystem. The famed "Black Rocks" section creates the ultimate desert playground - full of unique, black schist that has been sculpted by over a billion years of wind and water- hollowing out fun spots to climb over, under, and through - or just sit back with your river journal to record the day's highlights. 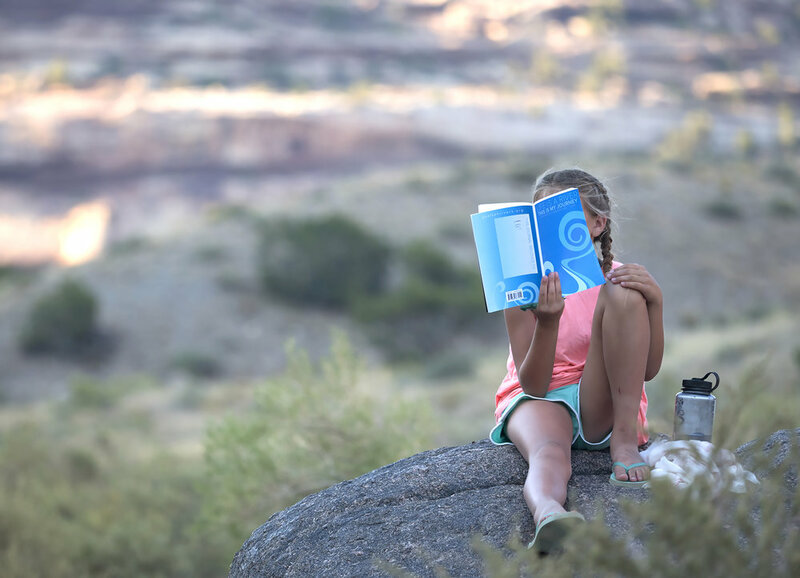 Ruby is the place for explorers who are more interested in tranquility than whitewater thrills - a welcoming introduction to the desert river life. Ruby Horsethief map - courtesy of Colorado Canyons Association. Numbers are mileage from Loma boat ramp. Day 1. Travel to Loma. Meet at 11am at GOALS world headquarters in Evergreen, CO - please arrive with a belly full of lunch. Today, we travel to Highline State Park in Loma, where we’ll spend the late afternoon swimming in their large lake to beat the western slope heat. When night begins to fall, we’ll set up camp in the grassy tent sites and begin exploring the GOALS curriculum. As excited as we are, we’ll try to get a good night’s sleep tonight, as we officially begin our river adventure tomorrow morning! Day 2. Getting in the flow. 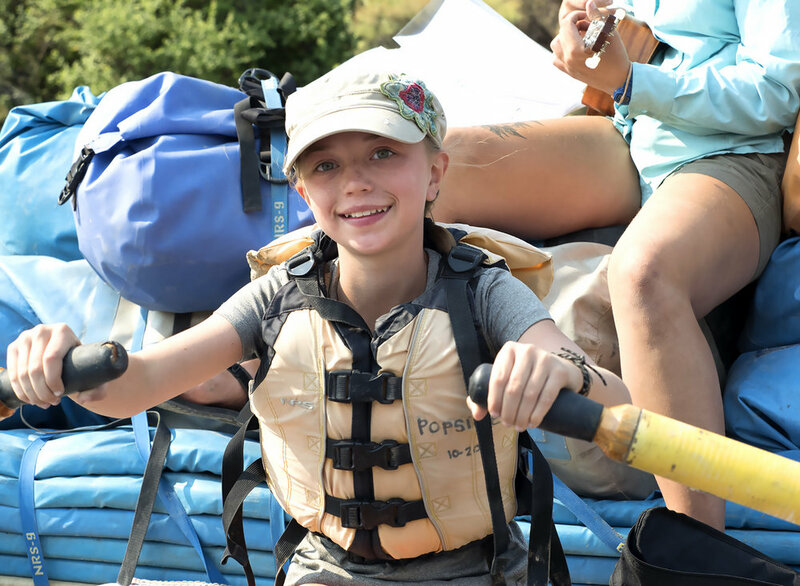 After packing up camp and a thorough safety talk, we’ll meet the rest of our professional guide crew and launch onto the Colorado River to begin our adventure. 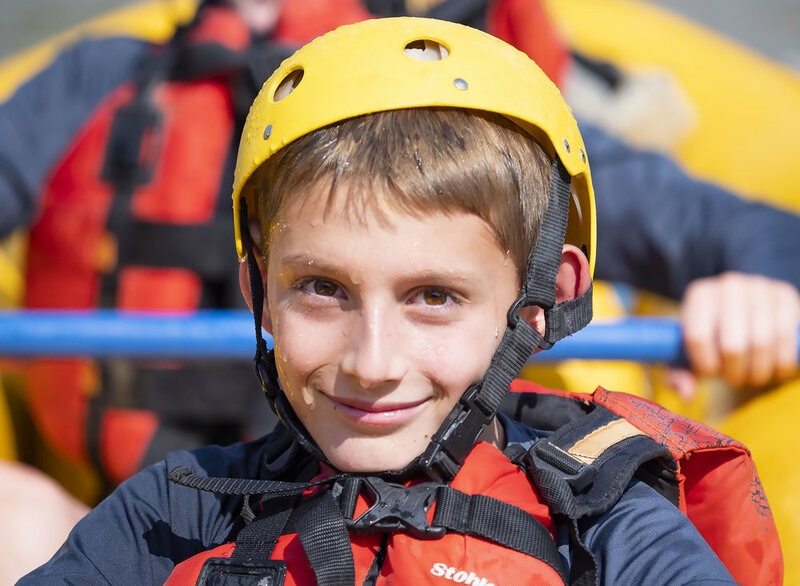 Slowly, the canyon walls will get taller and taller as we head downstream in rafts, inflatable kayaks, and on SUP boards. When our bellies tell us it’s time, we’ll pull over and make a delicious riverside lunch. After eating, we’ll continue downstream toward our first night’s camp - most likely in the area of the Cottonwood and Mee camps. As we float, we’ll be watching for bald eagles, river otters, and desert bighorn sheep. When we arrive at tonight’s camp, we’ll break into teams, some of whom will help in the kitchen, some on the boats, and some with setting up the camp itself. Late afternoon is a great time for camp games or a quick swim in a river eddy next to our large beach campsite to cool down. The kitchen crew will help our guides prepare tonight’s dinner, then we’ll circle up in the “living room” around a campfire and re-call our favorite parts of the day, play a game or two that our guides teach us, and ultimately retire to our tents or outdoor sleeping area for a great night of sleep under the desert stars. Day 3. Floating toward Black Rocks. After waking up to the smell of fresh coffee and the sound of guides working on a delicious, hearty breakfast in the camp kitchen, we’ll find ourselves smiling as we recognize just how good it feels to be starting a new day on the Colorado River. The kitchen crew will find their way into the camp kitchen while the rest of us watch the day come to life as the sunlight warms the canyon. After enjoying breakfast, we’ll get motivated to break down camp and head for the river - floating through a beautiful section of Ruby Canyon that will lead us to the famous “Black Rocks section” - home to some of the oldest exposed rock on planet Earth. We’ll plan to camp in this section tonight, and should be able to enjoy even more time in camp this afternoon because we’ll have a shorter day on the river. Lots of exploring this afternoon - examining the unique shapes of the Black Rocks section surrounding our camp that have been carved by millions of years of water and wind. Since this is our last night in the canyon, we’ll spend some time this evening composing a thank-you letter to the canyon - a GOALS tradition, then reflecting together on the growth we’ve experienced during our time here. One more night under the desert stars, and a fun day tomorrow still lie ahead! Day 4. Ancient Messages. As we leave the Black Rocks section today, we’ll head toward McDonald Creek for a short hike to some ancient petroglyphs. While studying them, we’ll learn about the early civilizations that lived here and created them - pondering the messages they may have been trying to share with us. 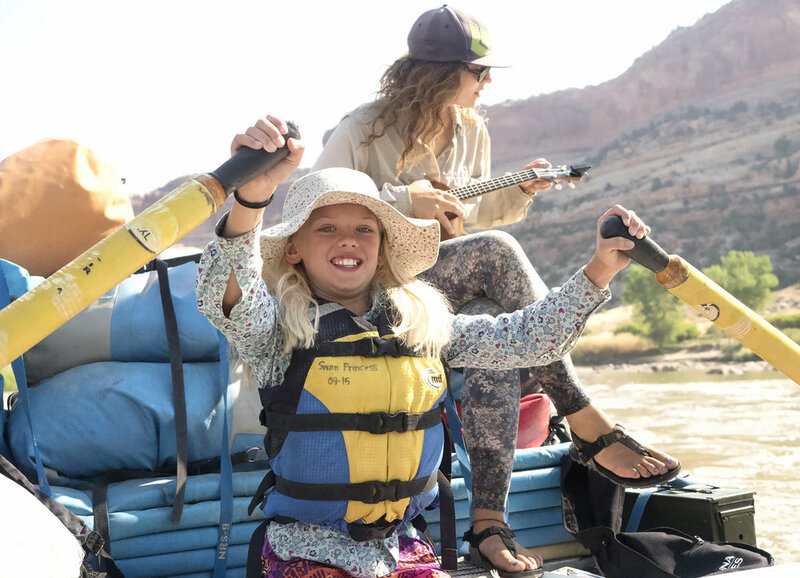 When we get back to our boats, there is still about 8 more miles of fun floating to the Westwater Canyon ranger station, where our river journey will end. After helping the guides load their trailers and giving them good-bye hugs, we’ll head for home - generally arriving between 8 and 10pm - already dreaming of the next time we can return to the Colorado River. GOALS all-inclusive rates extend beyond the unrivaled on-river experience. They also include all transportation (ground and air), lodging/campsites before and after the expedition, and all meals both on the river and on the road during our travel to/from the canyon. A detailed list of all inclusions (gear, government fees, supplies, etc.) is outlined below. Ground transportation from GOALS world headquarters in Evergreen, CO to Loma, CO at the beginning of the expedition and from Westwater, UT back to Evergreen at the conclusion. ALL MEALS - from dinner on day 1 through dinner on day 4. This includes all meals on the road and in the canyon (3B, 3L, 4D) - and accounts for all dietary restrictions and preferences. No need to send kids with road money for anything other than snacks. Campsite at Highline State Park in Loma, Colorado on night 1. All launch fees and government use fees for Ruby Canyon. Memories and lessons that will last a lifetime.